Missing teeth do not have to be a way of life. If you are not a candidate for dental implants, consider our other tooth replacement options, including custom-made precision bridges and precision full or partial dentures. 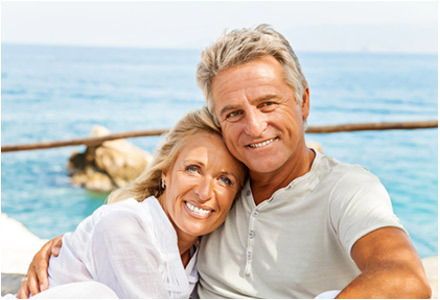 A denture is a removable appliance that replaces missing teeth and adjacent tissue. Made of resin and porcelain, complete dentures are used to replace all teeth. When some healthy teeth remain, a partial denture can be used. A partial denture also keeps the remaining, healthy teeth from shifting in the mouth. Full or partial dentures improve chewing ability, speech and support the facial muscles. Dentures also enhance appearance. While removable, these alternatives can be stable and beautiful when precision techniques and attention to detail are uncompromised. Like a fixed dental bridge, all dentures and partial dentures are built to our exacting standards on three-dimensional jaw movement simulators. In addition, we most often can eliminate the unsightly wires and clasps that show in many other types of dentures and partial dentures.